The pix are epic, telling a million stories. 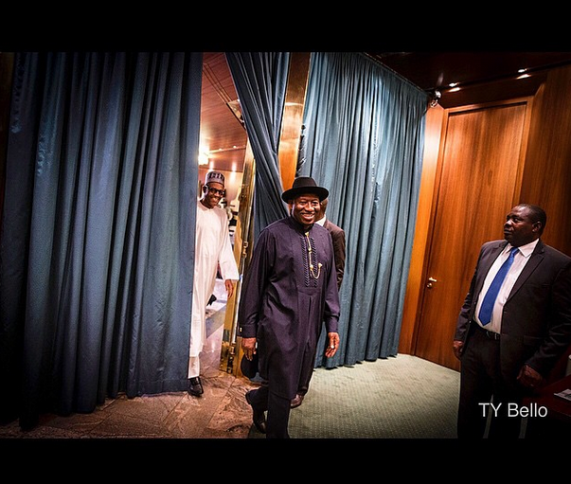 TY, you made millions photographing GEJ's family. Is this a campaign to be retained? Dis words strikedmy heart "It was a divine moment...Unguarded .. Side by side: Servants and Kings. Paving way and making way to and for a greener land''. God bless them abundantly. Thumbs up to them, and more power to their elbows. TY Bello has always been a powerful photographer and I love her music as well. Anyway Good one from GEJ and PMB. Awesome! TY Bello, you sef don try, allow another person try. Linda take note! THIS is WHAT YORUBA AND MALAAM CAN NOT DO !!! YOUR IBB, ABACHA & OBJ CAN NOT DO IT . WE NEED A ROAD MAP TO SECURE BETTER FUTURES FOR OUR COUNTRY NOT THESE AGGRANDISATION OF THE VERY GUY THAT PULLED US DOWN. I hope this does not mean Buhari will not try to recover our stolen money! We no go gree o. My darling TY, thanks for this beautiful piece; while they bloom, nigerians quarrel and instigate tribal chaos, keep it up especially LIBers. There is nothing special about the picture of holding hands. Body language expert will tell you that it is just for the public display. If you want to hold someone's hand wholeheartedly, you do by hoilding the whole hand and firmly. 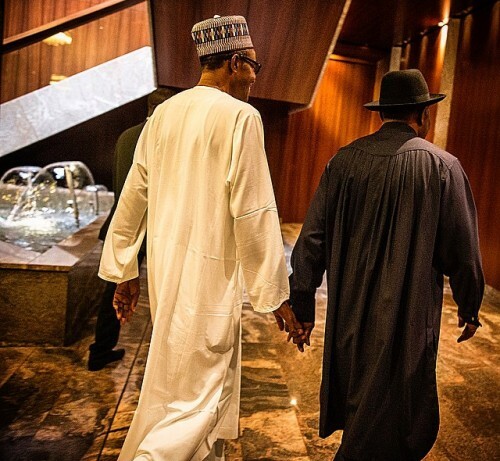 They were not holding hands, Jonathan was holding his hands(forcefully)!!! GMB just did not want to be rude about it. She means jonathan kept trying to hold him and cld only muster a few finger grabs d whole day. Why cant he hold him properly palm to palm? WEAK. Im sure he has a weak handshake as well. Bye bye Jona. Oga Johna is just too scared of probe....he will do anything to enter Bhuari's good book. Good quality pictures. TY be ready to take my wedding pictures o! Wow! Keeping grudges never solves any problems. Thanks TY! These are such priceless shots. Thats setting true good example to all and sundry.You see simple things like these help heal wounds and keep peace in the land.I am proud to be a Nigerian more than ever because of the behavior of our presidents(outgoing and incoming). Thanks Ty Bello and Linda for these pictures.I hope other African countries would learn frm both Pres.Jonathan and Pres.Buhari that power is transferable and it is not a do or die affair. Holding each others hands? That's GAY!! Gay your head! Omo buruku! You are a supreme fool. Annonymous 5:02 PM I guess holding ur dad, uncle, brother or friends hand is also being gay!? Just opening ur mouth to spill nonsense! GMB, and other newly sworn in Governor's, congrats, and I wish all of u d very best during ur tenure's in office. I pray u meet, and exceed d expectations of Nigerians. Dis words striked my heart "It was a divine moment...Unguarded .. Side by side: Servants and Kings. Paving way and making way to and for a greener land''. Away from the eyes of the public. Mumu which ur stolen money....them don recover obj own finsh? He is not afraid of anytin.....he has alws been like dt!! TY Bello u 4 turn to photographer nw. Linda take note. How many of the previous preside ever did so? For once in your life Segun quit being just a Yoruba but a Nigerian! The war is over! That's wat d picture depicts, time to move on and heal the nation. Join if you can. I am a gejite for life but I am in total support of my president Buhari! Bros u no try ooo "Striked". Epic. Powerful msg and powerful photos. Peace and unity! U can't hide ur bitter, hungry, miserable life even in public. Abusing sm1 u rarely knw. U should be in ur village practicing witchcraft. Jobless anonymous 5:07pm!